Here is a glimpse of some of the activities at the farm for June 2017. 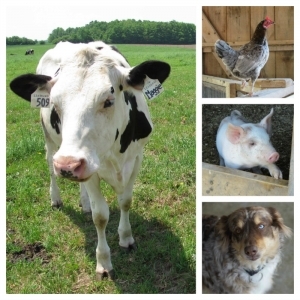 Use the menu to the right to also find Life on the Farm updates from other months! Planting Time for the Black Turtle Beans! 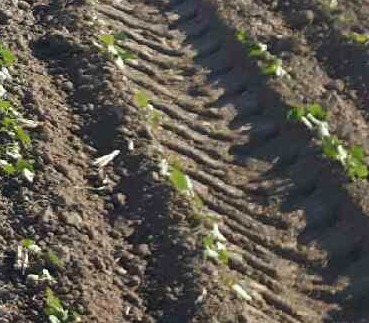 At the beginning of June, the beans were planted. As you can see it involves a lot of equipment, and that is only on the outside. Inside the tractor there is GPS for getting the rows straight and also an onboard computer! 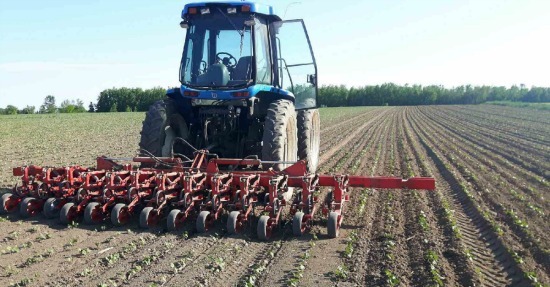 Modern farming technology and organic practices working together. When the sun shines you have to make hay. We started with the first cut June 7th. The moisture content of the hay when cut is about 80%, and it needs to be 35-40% before we put it in the silo as haylage. It takes about 2 days when we have good drying weather to get the hay to the 35-40%. This haylage is good quality so it will be fed to the milking cows later on. On June 9th, with 2 good drying days, the grass is dry enough (35% moisture / 65% dry matter) to be put into the silo for storage. 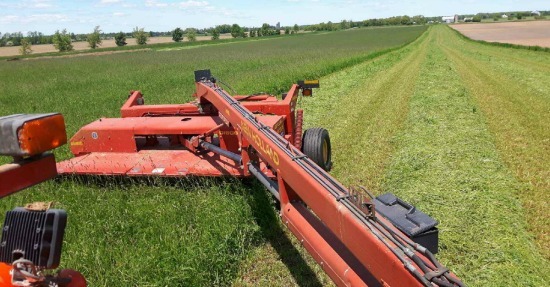 In this picture, the machine being pulled by the tractor is called a "Merger" and it puts the hay into big windrows. Then comes the Harvester that picks up the hay and chops it into little pieces, as well as blows it into a wagon. The wagon is then driven from the field to the farm. At the farm the wagon unloads into a blower that blows the haylage into the silo which is 80 feet tall. When all is harvested the silo gets sealed and the haylage starts to ferment. 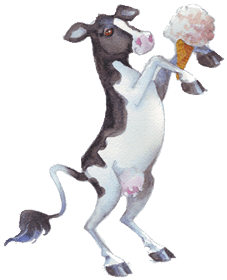 Bacteria eat the sugars and change it into lactase which drops the ph. This way the haylage/ feed is preserved, like sauerkraut, and will stay good for at least a year. In order to feed this to the cows there is a machine at the bottom of the silo that takes it out called a silo unloader. Monday (June 12th) it was time to spread liquid manure on the hay fields we just cut. This will help the second cut of hay grow better. Here on the farm we think about the wildlife on the farm too. 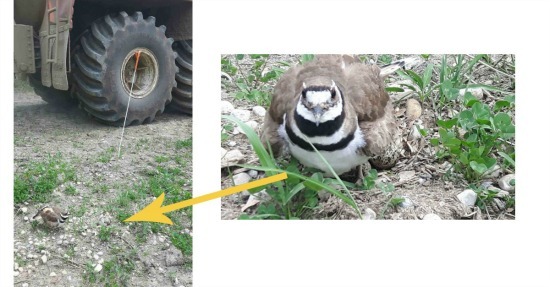 There is a killdeer nest right beside the manure pit. Martin took half an hour to find the location of the nest and mark it so it would not get destroyed. The trucks back up to the nest but the mother killdeer stays on it. You can see some of her 4 eggs under her. Okay so it's not glamorous, but this is Mapleton's most valuable resource being spread on the hay field that was just harvested. This will help the second cut of hay on that field grow better. In this case it is liquid manure that we are spreading - a mix of urine and manure that the cows drop when they are eating and it gets scraped away by the alley scraper, and eventually ends up in the manure pit. We only need to clean out the liquid manure pit once a year, because a majority of the excrements end up in the compost pack, which you can read more about here. 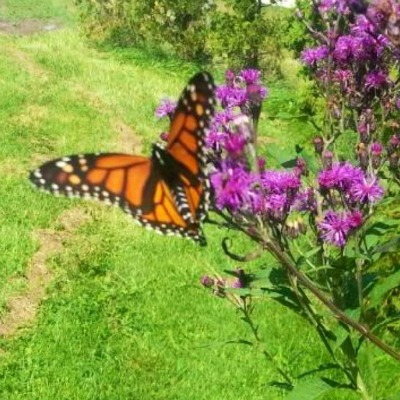 Mid - June, Martin spotted this Monarch butterfly and was able to get a quick but lovely picture. 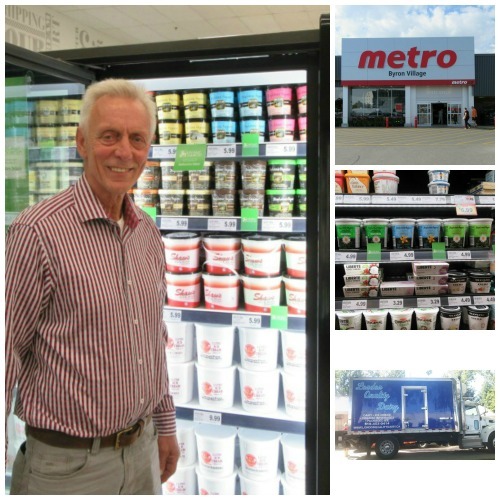 We're excited to have a selection of our ice cream, frozen yogurt and yogurt in Southwestern Ontario Metro stores as part of their Locally Sourced program. Locations include London, Tillsonburg, St. Thomas and Sarnia. Here are some pics from Martin at the London (Byron) location early June, and a picture of our distributor loaded and ready to make the necessary deliveries. The beans are up and growing well as of mid June. At this point they are big enough to be weeded. 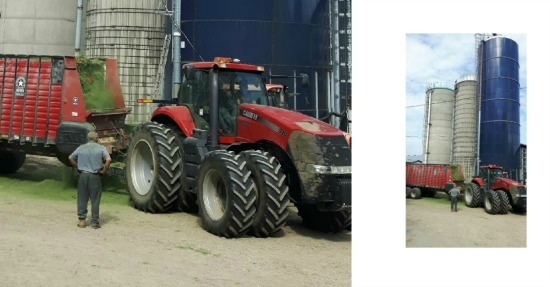 It takes a very good driver to do it, and the Crop Manager at Mapleton's is excellent at it. 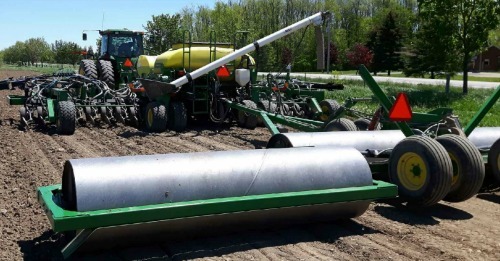 In this close up below you can see there is just enough room for the tractor tires to maneuver through the rows without running over the young bean plants. 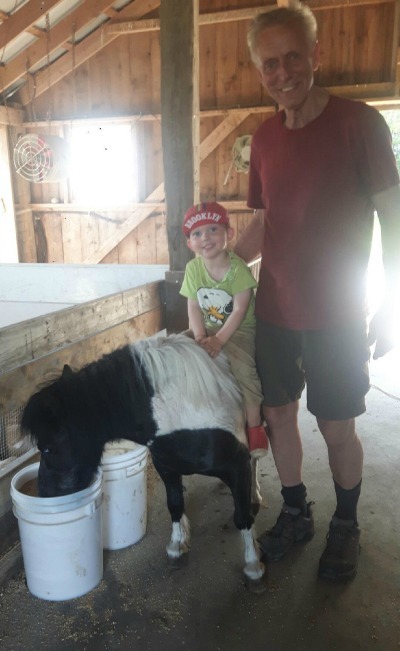 Martin's youngest grandson Acker lives in the United States, but was able to visit over Father's Day weekend along with his Mom & Dad. Here is a glimpse of some of Acker's adventures! 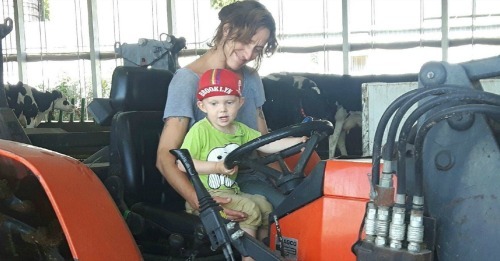 Acker with his Aunt Arwa. As Martin says "you have to train them young." Acker and his Aunt Arwa watching the birth of a calf. Acker's first! 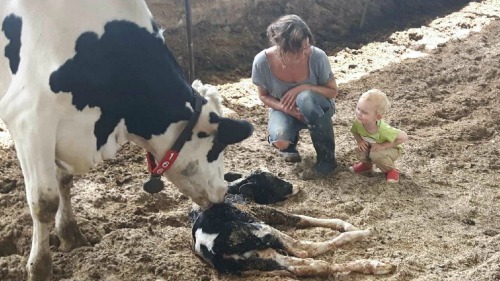 The calf was a girl, and named Adrienne for Acker's mom. Martin with Acker and Cherokee. This picture is from the morning of June 23rd. Overnight the farm received 5 inches of rain in 6 hours! At the left of the picture is a small creek that has filled and overflowed with the rain causing some flooding. The area that is flooded also happens to be the laneway from the current pasture area to the barn. 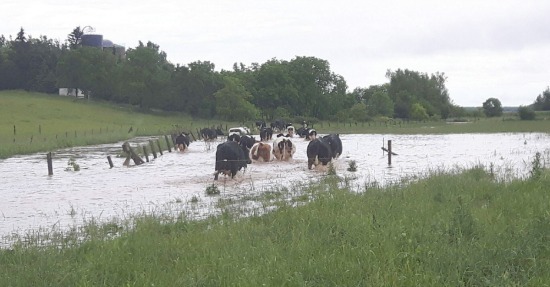 Overnight the cows were out on the pasture which is at a higher level and not flooded. However, they didn't want to walk through the flooded area to go back to the barn. For the rest of the day the cows will stay inside to minimize damage to the pasture. In terms of the crops... there is a bit of a washout in some areas, and some are under water, but as long as the water is gone in 24 hours they should be fine. The bigger concern at this point is weed control, because with the wet conditions we can't get into the fields to weed. We'll be looking for some hot, dry weather after this wet spell to dry things up and get things growing.